A medicated hand cleanser with 0.3% chloroxylenol (PCMX) which combines effective broad-spectrum antimicrobial activity with conditioners to be gentle on hands while it cleans. 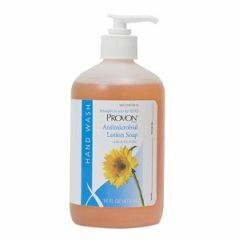 AllegroMedical.com presents The Provon Liquid Antibacterial Lotion Soap. A medicated hand cleanser with 0. 3% chloroxylenol (PCMX) which combines effective broad-spectrum antimicrobial activity with conditioners to be gentle on hands while it cleans. Dermatologist tested.